Welcome to our farm’s blog and website! 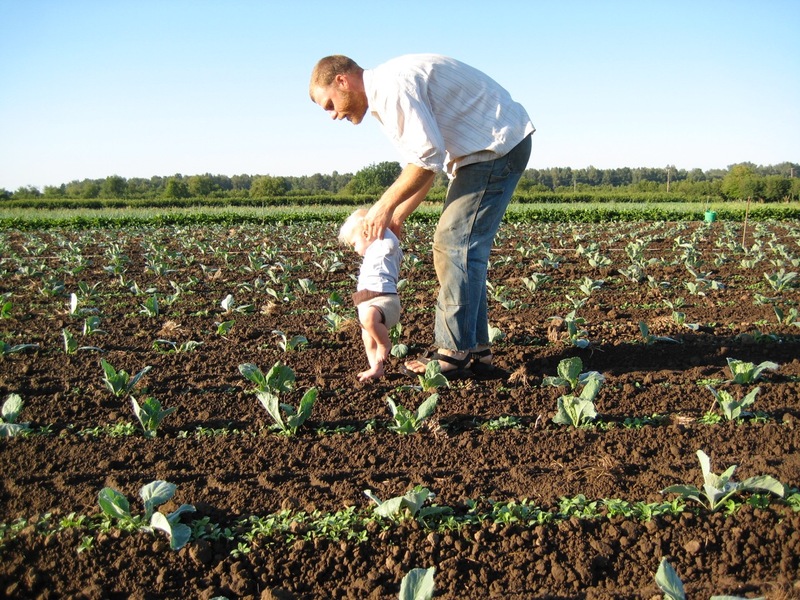 Oakhill Organics is a family-run farm located on Grand Island. We grow everything we sell right here on our farm, and everything that we grow is sold directly to customers here in Yamhill County! You can find out more information about what and how we grow by following the links above; or, scroll down to read our latest farm news on our blog! Our lowest ground at the peak of the recent flood event — check out the fence posts that are almost submerged! After taking several months off from CSA harvest and subsequently also newsletter writing, I have been surprised to resume the rhythm and remember just how full one week on the farm can be! This week was especially eventful because of the recent flood we experienced. I mentioned this was happening in last week’s newsletter, but at the time I was still hoping that it wouldn’t be that big. 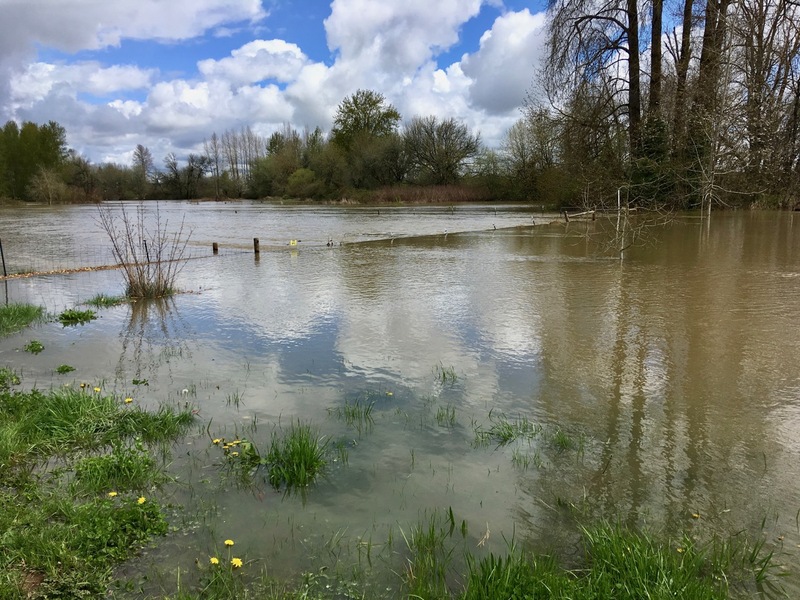 But actually by Thursday morning, we were really hoping that we could actually get to the first CSA pick-up of the year, because the water kept rising and rising, and the predicted crest was going up too — and quickly! Over the years of occasional high water events, we’ve carefully observed how water rises here on Grand Island. 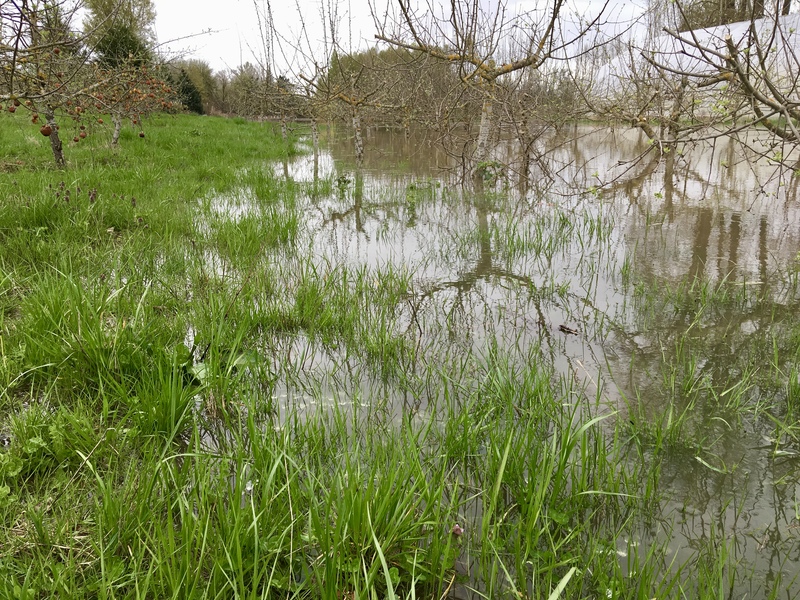 For us, the lowest field in my parents’ property gets wet first and slowly fills more and more full as the river rises. Next comes a sliver of our field along the creek, which eventually cuts through the orchard closest to our house. At that point, we cross our fingers that it doesn’t go any higher, because the next step is our low hoop houses. Those did in fact flood this last week (in fact they had several feet of water at the peak!). Around the same time that our greenhouses fill, water goes across the road that connects us to our land on the other side of the creek. The timing of that cut-off used to be important when we had animals on pasture over there, but now we rent out that land to another organic farmer. Finally, the big thing we worry about: the water goes across our road between us and the bridge off the island. On Thursday morning, that road was still open but the river was still rising. It was still clear Thursday night, and we went to bed grateful that we had made it through the first CSA pick-up of the year, but we both had full off-island schedules for Friday! What would we wake up to? We woke up to water over the road! In the morning it was still shallow enough to drive through, but the river was still rising. So we all left the island with our fingers crossed that we’d be able to get back home. Casey literally brought our tandem kayak and life jackets with him in the back of his pick-up, just in case we would need to paddle our way home. That evening I was hosting a party for a friend in town, and I was so happy to actually make it to the party I’d been planning for weeks! But, about halfway through the party, my mom texted with an update that the water was higher (and rising), and trucks were struggling to get through. So we said early good-byes and drove both our pick-up and my SUV back to the farm, parked my SUV above the bridge at a generous neighbors’ house and then very carefully approached the water just at dusk not knowing if we’d be wading or paddling or maybe not even getting to our beds at all that evening. But, hoorah! The pick-up truck made it through, and I can’t remember feeling so grateful for my own bed in a long time. When the water is high like that, the entire landscape changes and it is beautiful, startling, fascinating and tragic to some. Several of our farmer neighbors suffered losses because of the flood: spring crops that were ready to harvest went under water for one farmer; bee hives for another. Other neighbors who live past certain early-to-go-under roads spent almost a week sleeping away from home — a majorly unplanned interruption in life! We saw some spring-planted crops go under, but now that they’re back out they seem to have survived (and for the most part they weren’t ready to harvest yet anyway). We mostly enjoyed exploring the changed island, especially once we knew we’d met our obligations off-island and could just be home and be present for the event. Rusty found an exciting discovery in our orchard though during the flood: an injured beaver that was lying, mostly immobile, between two rows of our trees. Without Rusty’s regular rambles, we likely wouldn’t have found it for days and it would have probably died without our noticing it. It had injuries all around its neck and face and seemed to be in a lot of pain. I wasn’t really sure what if anything we could (or should) do for a beaver in this condition, but I reached out to our neighbors to ask. They connected us with Turtle Ridge Wildlife Center in Salem, who explained that I’d need to transport it myself. I wasn’t immediately comfortable with the logistics of handling a very injured beaver, both not wanting to be injured myself but also not wanting to inflict further harm (or trauma) in my efforts. Thankfully, one of our neighbors (who used to volunteer at Turtle Ridge) offered to come help, and together we loaded her into a kennel and our neighbor drove her to the center. The folks at Turtle Ridge suggested the injuries looked like they were likely from another beaver, and we wondered if the flood had forced her (and potentially other beavers) out of their dens and created situations where beavers were needing to more actively defend their territory than usual. Sadly, her injuries were ultimately too severe for rehabilitation. Finding, watching, and then handling a beaver on our property felt like a rare opportunity to interact with these mostly shy animals that co-inhabit this place alongside us. While I feel okay about letting nature take its course in such scenarios, I also realized that this opportunity to try and help rehabilitate injured wildlife is a blessing for people as much as for the animals themselves. It felt like an honor to be close to her. I was also grateful for the opportunity to connect with a neighbor whom we rarely see. Living in a rural area, we have always been stymied by how to naturally interact with all our neighbors as the road is our only shared space and people tend to be private. But events such as floods (and injured beavers apparently!) do provide opportunities for all of us to connect, even if it’s mostly through social media. Although everyone on the island is very unique, we all share the reality of living with a bridge connection to the mainland, and during a flood that’s some important common ground. And, now? Most of our field is dry or draining. And, the cherries are blooming! And, the sky is blue! And, the spring grass is so so so wonderfully green! Casey and I thoroughly enjoyed harvesting for the CSA together today, rejoicing in the mild weather (after a pretty cold spring!) and the knowledge that we would for sure be able to drive off the island for tomorrow’s pick-up! We have some beautiful vegetables for you again this week — a continued mix of over-wintered items, storage crops, and spring-planted veggies from the hoop houses. The peas are putting out their blossoms already, and the spring will continue to be an ever-changing season, rich in greens and other good things! We hope you all enjoyed the first week of our 2019 CSA! Please let us know if you have any questions about your experience so far. Also, we do still have room for more folks if you know someone who is interested! Folks may have noticed that several our items were distributed in plastic produce bags at last week’s pick-up. Over the years, we have researched many options for distributing items in a way that is convenient for our members and also keeps the produce (especially tender greens such as we have now) in the best possible shape. Because most vegetables need to be stored in some kind of container or bag in the fridge, they are ready to pick-up and take home for storage. However, while we find that plastic bags work well for keeping veggies in good shape during transport and storage, they represent a resource and eventual landfill material. So, to that end, we have several suggestions for people as to how they can reduce their plastic use and still keep their veggies happy. First, if you choose to take our bags, we ask that you re-use that bag as many times as possible for other uses! That’s a great way to reduce the overall plastic in the world. Alternately, you could choose to not take a plastic bag. If you bring your own previously used plastic bags (or cloth bags), Casey is happy to fill those for you at pick-up. We have many members who do this weekly, and it requires a slightly longer wait time for them, but they just factor that in to their pick-up. Or, some people just transfer items from bags that are already in the bins to their own bags or basket. If you leave the fresh bags with us, we can re-use them right away. Thank you for thinking about the best way for you to reduce your plastic bag usage! Please share with us other ideas you may have too! Goldrush apples — Have you tried this unique apple variety yet? These are an incredible storage variety that we discovered when we went to put in our orchard. They are a new variety (with loads of good disease resistance) but with the complex flavor profile I expect from heirloom types (which often are susceptible to blight and scab). They also store really really really well in our cooler, meaning that we often eat them more in spring than in the fall when all our other apple types are still available. You can eat these fresh (they are sweet!!!!) or use them to cook (they have good texture that doesn’t just fall apart). Highly recommend you trying these at least once. Seasonal salad mix — A mix of tender lettuce, arugula, mizuna. Some of the leaves are larger and could benefit from chopping, but the leaves are very tender so don’t over-dress! 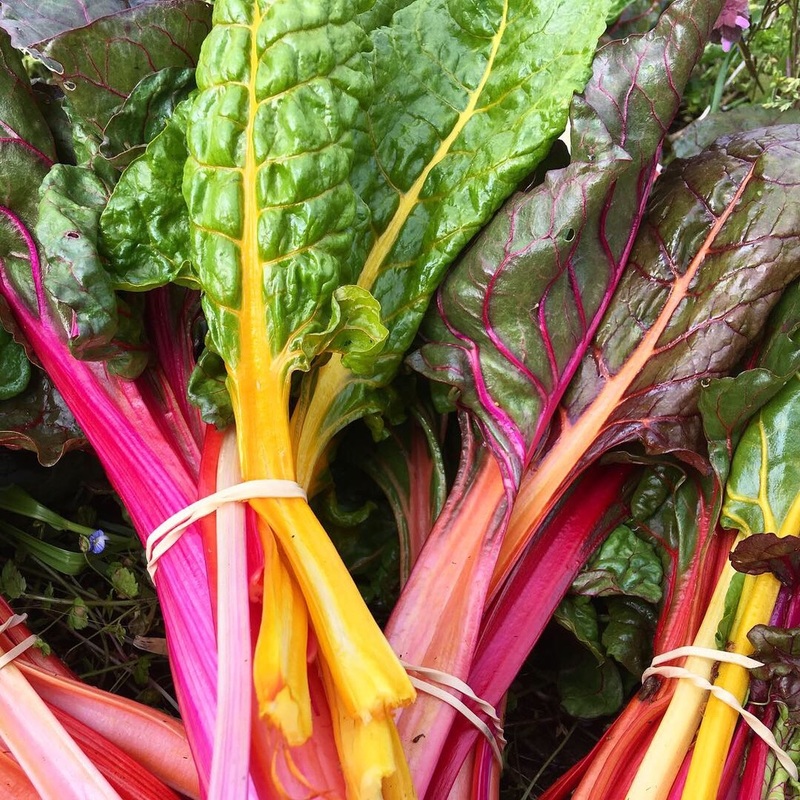 Rainbow chard — Casey and I have been farming now for fifteen years if you include our training, and I am still amazed at the vibrant colors possible in a good planting of rainbow chard. This week’s harvest looked especially bright in the soft morning light. It will be delicious too! Carrots — Don’t let the imperfect exteriors of these carrots fool you! Give them a quick peel and trim, and they are beautiful inside, with delicious flavor suitable for cooking or just eating as sticks (“Ants on a log,” anyone?). We are SO happy to be getting back into the weekly rhythm of harvesting for our CSA community. 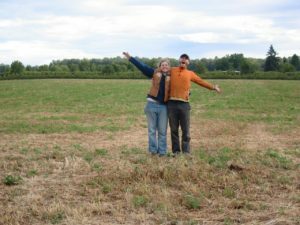 For a couple of years now, Casey and I have been talking about the need for a sabbatical from the farm. In any profession, beloved or not, there comes a time when it’s healthy to step back from the routine, breathe, and get re-inspired. 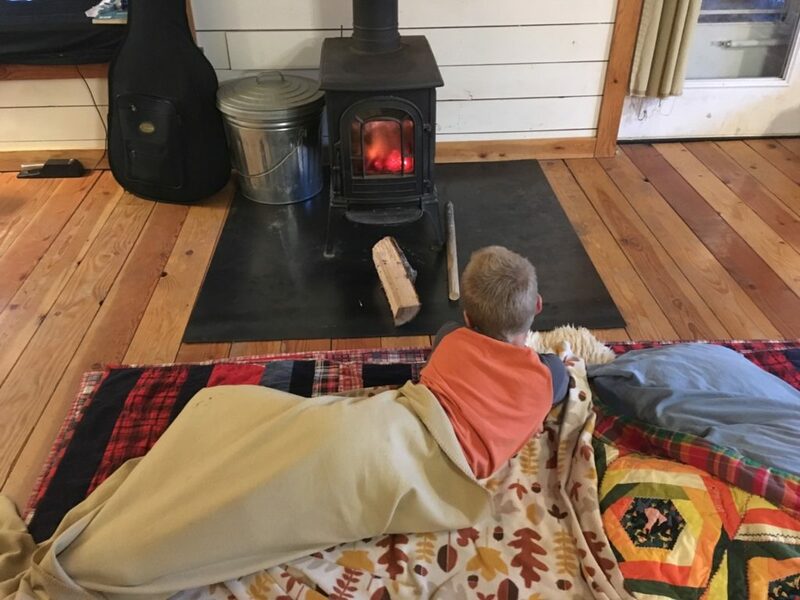 I have to admit, however, that I think we had been picturing a long winter of camping in the desert (or something similar) rather than a winter of Casey adjusting to a new, very responsible, role in our community. Either way, here we are, back in the fields and looking forward to restarting our regular weekly date with all of you! We haven’t made many changes to the program this year — in fact, if anything, our brief stepping back highlighted to us how well we’d fine tuned our CSA system over the years into something that feels like it works really well for our farm and for our farm members. We still love the flexibility we offer our members to build their own shares each week, based on their preferences. We still love having a special pick-up space that is comfortable for everyone to linger if they want to visit with us or friends. We still love that our CSA offers a unique mix of annual vegetables and perennial fruits, all from our farm. We like the niche we’ve formed in the wider food community of Yamhill County! One change returning members will notice is that the storefront itself has been made-over. We’re sharing the space this year with Suzor Wines, who will be using it on different days for wine tasting events. We appreciate the work they did this winter to upgrade parts of the space (sealing the floor, exposing more of the cool brick wall, covering up the drop ceiling panels, etc.). With how we’re sharing the space, the functionality and flow for our members will remain the same, but with some new touches. Also, folks may remember from last year’s newsletters that our former organic certifying body closed shop mid-season (!!!!!!!). At the time, we felt too overwhelmed by summer work to apply fresh with another certifying body, but we have now submitted our certification materials to the Oregon Department of Agriculture (ODA). So, if all goes as it should, we’ll be officially certified again in a few weeks/months. We’ll let you know how that goes! Anyhow, the Willamette River is at so-called “action stage” right now, meaning that we now have a waterfront view from our house! Over the years, we’ve experienced many such events, including an event that actually qualified for the label “minor flood,” so we knew what to expect when the National Weather Service began predicting a rise. We pulled out our “flood notes” folder and looked at what we observed in past events: at what level does the river cross our fields? fill out lower greenhouses? move through our home orchard? cross the road off the island? Given the timing with our first CSA pick-up, Casey and I were a little less than enthusiastic this time around. A high water event in, say December, is way more fun for us farmers than in early April when we’ve got two lower greenhouses full of well-tended plants (we’ll pull the lettuce and re-plant with zucchini after the water goes down). But, the kids have filled in for our lack of enthusiasm. It’s been long enough since we’ve had high water that I think it feels very fresh and exciting for them to monitor the water’s rising in the fields. Each time they wake up, or we come home from town, they run down to the lowest part of our field to note how the water has changed. Last night, they hauled Rusty’s kid-sized kayak and lifejackets down to a safe spot at the edge of our field and paddled around for awhile before bed, keeping alive a tradition we started years ago of going out on flood waters in boats or on surfboards with wetsuits. We figure that if we’re going to have the river in our backyard, we might as well have some fun on it! We also love watching the water birds during these events. The ducks especially always seem delighted with the extra space. Yesterday the kids and I spotted three ducks and a couple of Canada geese, looking — to us humans — like they were having the time of their life on what was (and will be again) a field of organic grass and mustards. 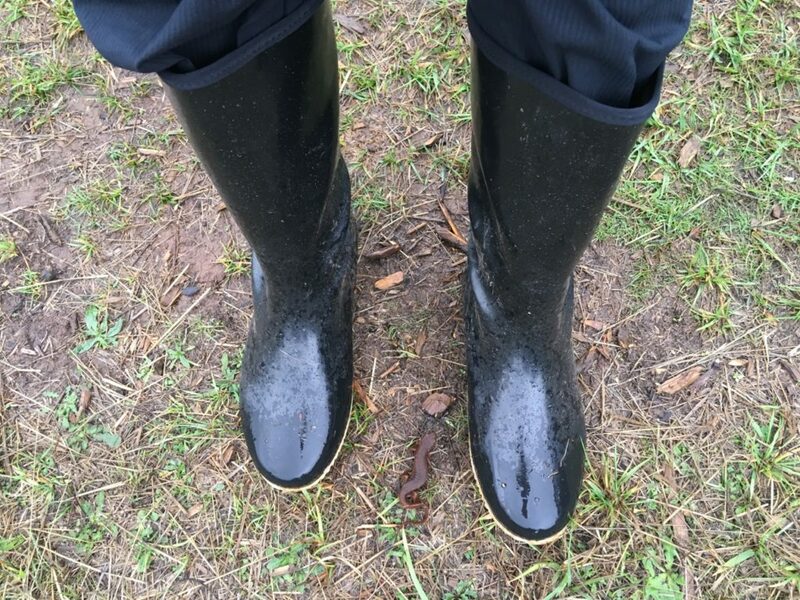 The water will recede soon enough — when we get wet it is because the river is high, but our soil is still well drained — and the bulk of our fields and greenhouses are still safe and dry. And then we’re hoping we jump right into late Spring warm growing weather! It was a colder late winter and early spring than we’ve had for years now, and we’re getting antsy for those days of super growth! They will come! Have you made your first CSA payment yet? We ask for one-third of your total or the full value by the first CSA pick-up. You can bring a check or cash with you if that works best! I’ll have account details at pick-up too, so you can always ask me questions when you come to pick up your veggies. Put these dates on your calendar! You are invited to join us at the farm on Wednesday, May 15 at 5 pm for a potato planting party and potluck, and on Saturday, October 12 for our annual pumpkin patch open house featuring live music, farm tours, cider pressing, and a veggie/fruit tasting. While we aim to grow fruits and vegetables that are delicious and wonderful for their own sake, we also know that a CSA is also about connection and community. That’s why we’ve built a pick-up style that encourages interaction, write weekly newsletters with farm news, and also host these regular on-farm events. We hope that you’ll join us for one of them, this year or in the future! 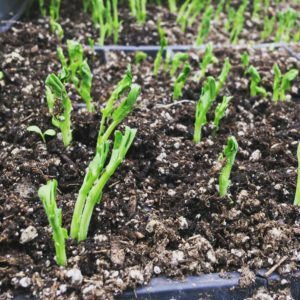 Meet this week’s vegetables: April is an interesting time of year to begin a CSA, since it is so much of a transition between winter storage/over-wintered crops and newly planted greenhouse crops. In the coming weeks, you’ll get to eat some of both as we slowly eventually shift to all spring-planted and then finally get into the main season field crops. 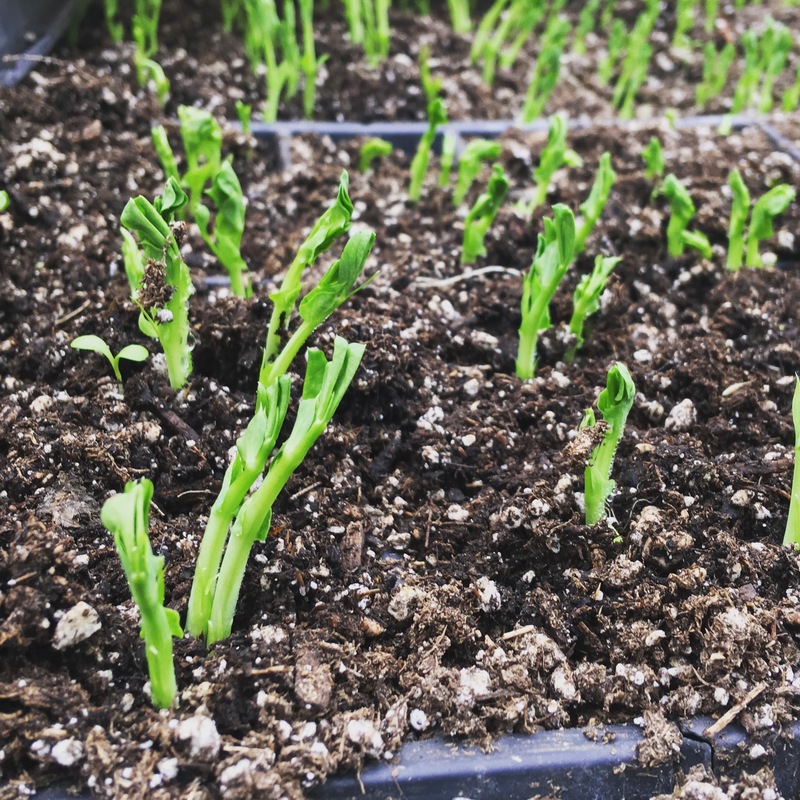 Rapini — For those of you new to seasonal eating or our CSA, let me introduce you to one of early spring’s fun treats: “Rapini” is the word used to refer to the edible flower buds put up by biennial brassica plants after a winter. Each kind of brassica has its own unique rapini, but they are all tasty! We treat them like any leafy green vegetable, usually chopping and sautéing with butter (and maybe some kind of onion or allium if we have them). You can also roast rapini so that it’s slightly crispy (similar to how one might make kale chips — make sure your pan has a single layer for best results). Salad mix — A mix of many kinds of green growing in our field right now! Expect a wide range of flavors and textures, all of them delicious! We find that cooler season salads stand up well to more liberal dressing. We especially love using a creamy dressing that isn’t too sharp so that we can load it up and enjoy. To make a salad a meal, top with nuts, cheese, and chunks of meat. Mizuna — Mizuna is an Asian green suitable for eating as a salad or for throwing into a pan and very lightly sautéing. Beautiful recent snowy morning on the farm! Hello, farm friends! We miiiiisssssssssss you! We are now halfway through February and still enjoying our “winter break” — the longest we’ve taken from the CSA since 2007 when we were building our house! I’ll be honest: it’s felt … strange (and even disorienting in some ways) to be missing the regular weekly rhythm of harvesting and delivering seasonal produce to our community. Over the last 13 seasons that rhythm has become such an integral part of our life, and we are excited to jump back into that on April 11 as we begin our 14th CSA season. But, at the same time, this break has been healthy for us and for our family too. The farm is such a year-round endeavor for us that it’s been positive to step back and breathe and take a long look at this farm project we’ve built over a decade. 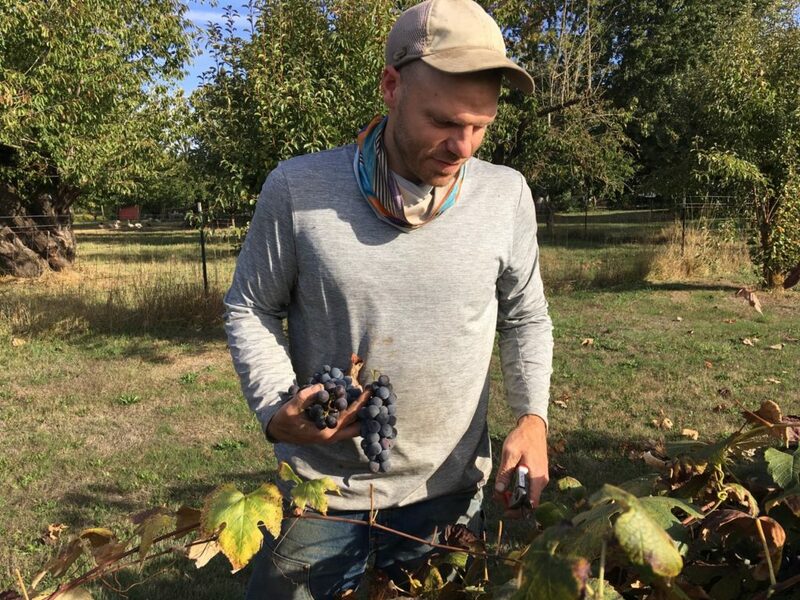 Even though Casey’s new position as Yamhill County Commissioner is what spurred this sabbatical, it’s been important for our relationship with the farm too. It’s also given us time to catch up on some “life stuff” that just never seemed to find its way into a life full of farm rhythms, including re-thinking how we set up our office (paperwork is also a part of farming!). 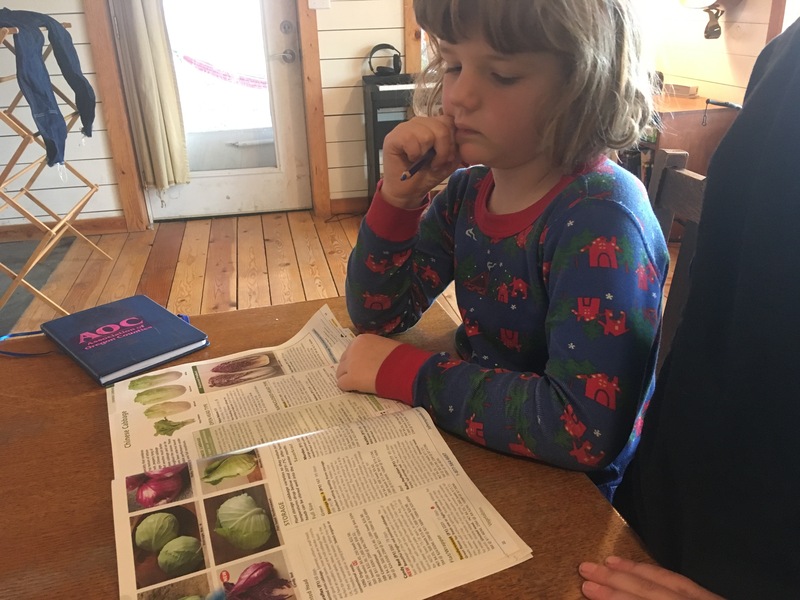 We’ve also had time to get Casey adjusted to his new role and start planning how I (Katie) will step into a bigger management role on the farm again, which inevitably involves rethinking some of how we approach homeschooling the kids. This stage of life feels a little like one of those puzzles where you can only move one piece at a time, and so having a break from the CSA rhythm has given us more time to move those pieces, one. at. a. time. Pea shoots! They’re now much bigger and growing in the greenhouse. 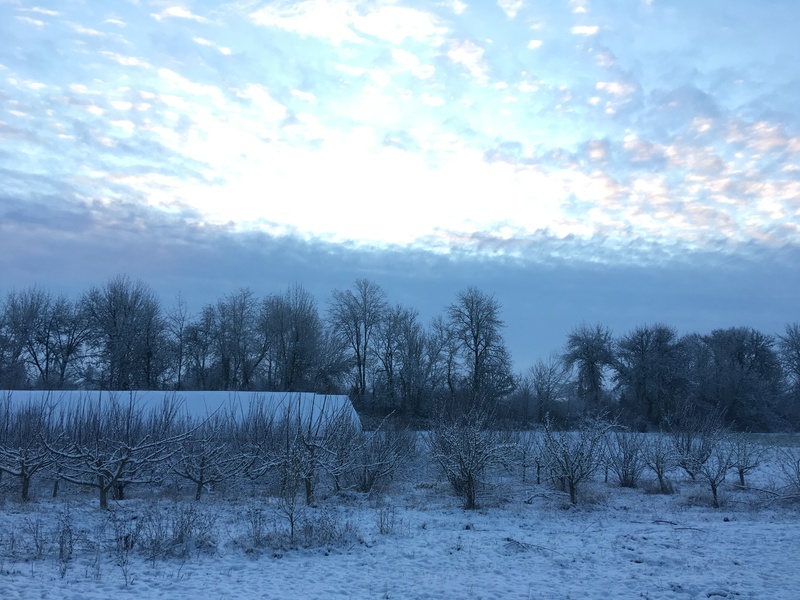 Along the way, we’ve also been doing the usual winter work: cleaning up our greenhouses, sowing seeds, pruning the orchards, working on winter paperwork (taxes, organic certification forms, etc. ), transplanting into the greenhouses, beginning ground prep in the fields. We also celebrated the holidays, learned to play lots of new games (Dottie is a big fan! ), played in the small amount of snow we’ve had down here in the flats, played outside as much as possible (the kids have dug a pit fort at the edge of our field), visited with lots of friends, and more. Actually, there’s one thing this winter hasn’t been much of, and that’s a rest. I imagine there are many ways to use a sabbatical — to rest deeply or to put energy into something that’s different than one’s normal job responsibilities. I’d say this “break” has fallen much more into the second category than the first. In many ways, settling back into farm rhythms will probably feel restful and familiar after months of working on the random projects of life and work. Ordering seeds for the kids’ garden! Yes, we still have room in our 2019 CSA! Aside from the later start, it will be the same successful model we’ve operated for years and years. You can find out lots more info here. We’ve slightly lengthened the pick-up window time for 2019 to better accommodate some schedules (particularly those of parents picking kids up from school) — we’re going to be open 3:00-6:30. We hope that you too are having a fruitful winter and enjoying the magic of a season that brings the opportunities of darkness and inside time. Spring is just around the corner and already starting to show up in daffodil shoots and pushing buds! Thinking of you all! Doing work on your behalf too … always! Hello, friends! Since we ended our CSA in October this year, it’s been awhile now since we’ve sent an update out into the world. 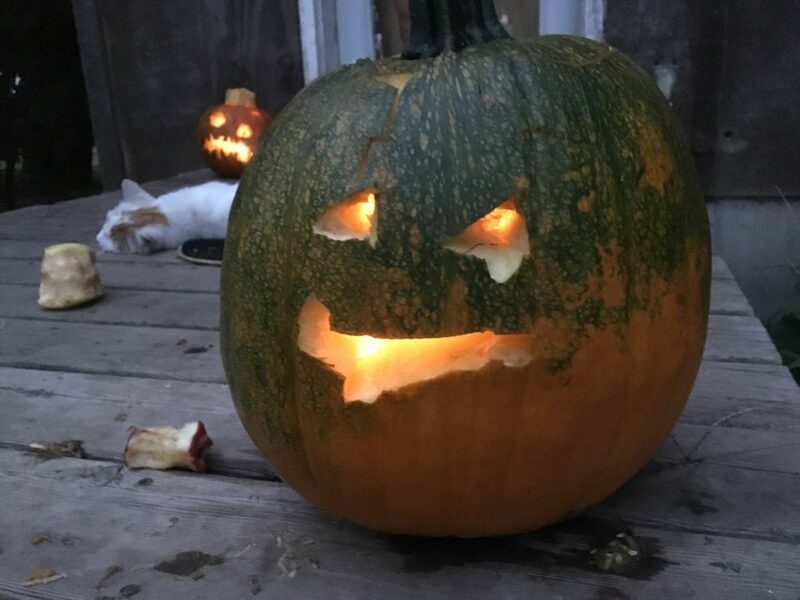 It’s been a full fall. 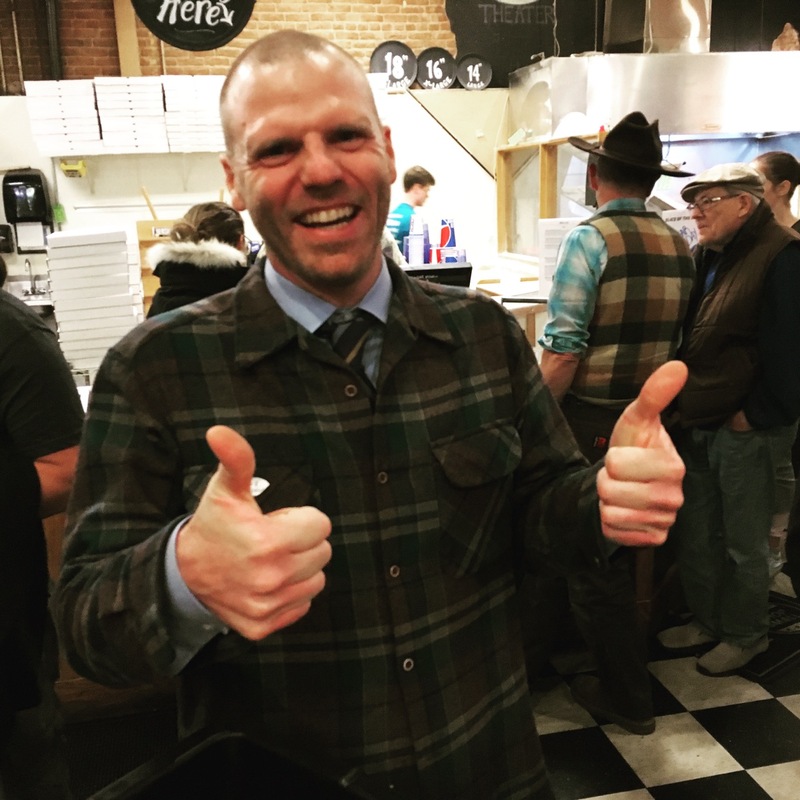 After the CSA ended, we spent most of our time making a final push on Casey’s campaign for Yamhill County Commissioner, culminating in news that I imagine most of our CSA members and regular readers probably already heard: he won! It was the most exciting outcome, and we were overjoyed to share that evening with a room full of friends and supporters and other people who were also awaiting election results that night. So many people had worked so hard toward this goal, many of whom had never been involved in local politics before, and we were perhaps above all else so grateful that their commitment was affirmed in this way. 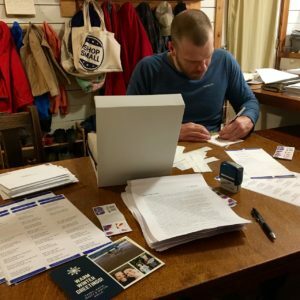 Not only does Casey now have a new role in local politics, but we think many other people do too, as we know they will continue to stay involved now that they know how much their work really and truly matters. What a huge achievement for our community! Casey after hearing of his significant winning lead on election night! Casey’s work began almost immediately, as his schedule began to quickly fill with meetings. But, since that BIG (!!!!) news in early November, our family has also been quietly regrouping and taking the time to reconnect with each other and then assess how this profound shift in Casey’s role will affect everything else we do. It’s been a time of a lot of ups and downs, to be honest. Much like with many positive passages in life (graduation, birth of new babies, marriage, etc. ), there can be twinges of grief buried in the abundant joy. Because new things inevitably mean letting go of older things: older dynamics, familiar roles, former freedoms … Not everything goes away, but things inevitably shift, often in unexpected ways. We were now facing a load of such shifts, needing to make some big decisions about how we would intentionally shape the new reality to fit what we’ve loved best about the old one. Also, we were very tired after a full year and took lots of time to rest as well. And celebrate! This season of the year is so full of family get-togethers for us, and we were happy to give thanks with our families and also celebrate Rusty’s ninth birthday last week! 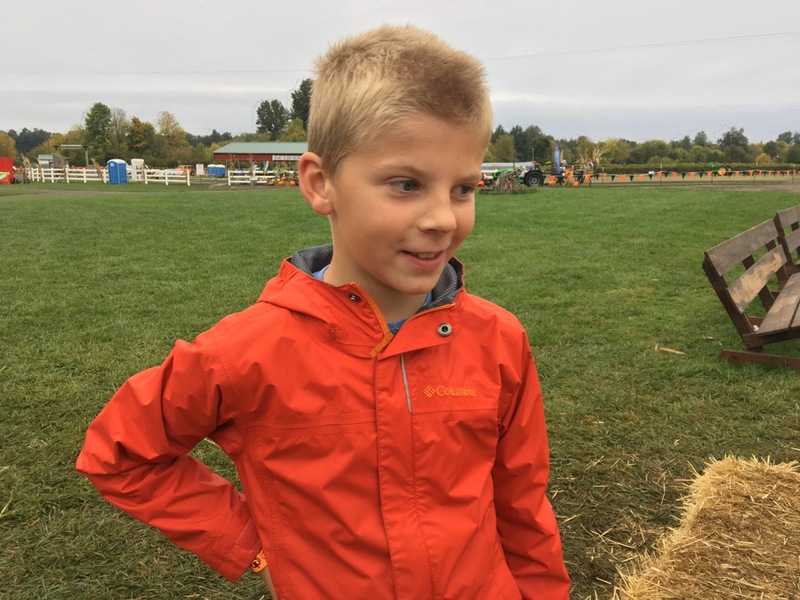 Nine years after his birth, this big kid is still changing the way we think about our farm spaces! 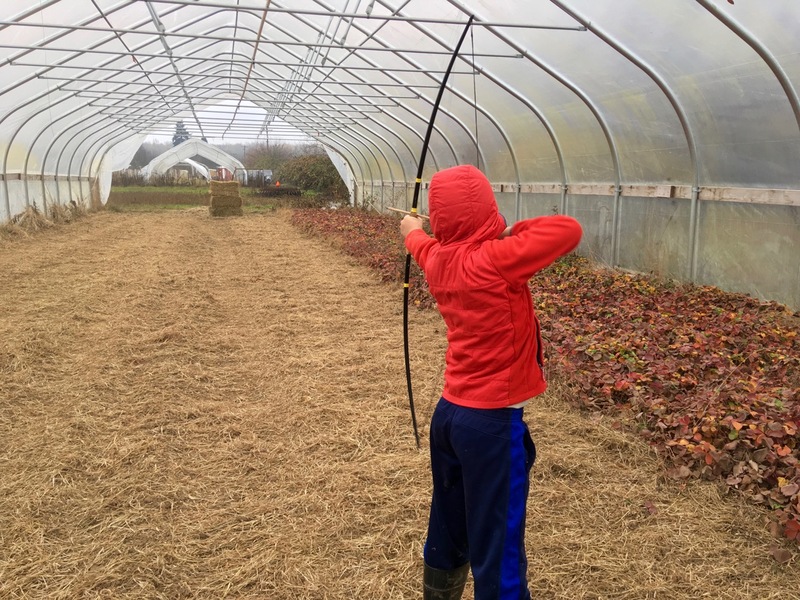 Our strawberry greenhouse is now doubling as an archery range while it takes its winter rest! After all this time spent pondering and talking and weighing our options, we are approaching 2019 with a clear vision of how we want our new life to look. We wanted to keep things as simple as possible going forward, with the emphasis falling on the things we love the most. Casey will move into his role as Commissioner officially on January 7, but what would we continue to prioritize as a couple, as a family, and for me as an individual? And, after our family, the farm and our CSA remains a deep source of joy for us. We have plans in place now for sustaining that core venture as we go forward, with me moving more into a leadership role. Now that the kids are older, this is possible, plus I’m planning to hire a few helpers as needed seasonally. I’m excited to once again have that extended community feel of having a small crew coming and going! In terms of things that we’re letting go, Casey has decided to pause his law studies for now. Originally the idea was to study law in order to someday run for office, and then the eventual goal was met sooner than expected! We are also not going to renew our OLCC grower’s license in 2019, freeing us from another set of regulations and procedures to think about! What will all this mean for you, our valued farm members? We will move into 2019 smoothly, with a strong sense of continuity for you: the “market-style” CSA system we’ve fine tuned over the years will remain the same, in the same convenient and welcoming storefront location. This year we’re going to be sharing the storefront with a local winery (who will be hosting wine tasting on the weekends), so the space will get some updating in its decor while the layout and functions remain the same. We will begin our CSA on April 11 this year, later than has been typical, in order to provide plenty of time and space for the transition. However, we will once again run through mid-November (for a total of 33 weeks) and will be planting a winter garden with plans of returning to our long 40-week season in 2020. We love having an almost year-round CSA, and continuing that experience into the future is a high priority for us (and our future farm team!). The only other change is that we’re offering a new CSA option with extra flexibility for folks who need that because of work travel schedules or other commitments. With our new “a la carte CSA” option, you can put credit onto your account that you will then deduct from on the weeks that you come to pick-up based on the number of items you take that week (items cost $3 each). Because we still want this option to function with a CSA level of commitment, we ask for a minimum of $300 for the season and any remaining credit disappears at the end of the season (but you can add more credit if you run out before the end of the season!). We still think buying a set number of items per week will be the most convenient option for most of our members, but we also know that the “a la carte” option will help keep some people connected to the farm even if their lives are feel less constant from week to week. We’re also going to again become certified organic in 2019. Last year Stellar, our former certifying agency shut down mid-season leaving us with the hard decision about whether to drop our certification or start fresh with a new certifier — we chose to temporarily drop our certification so we could focus on the paperwork part of the farm in the winter. 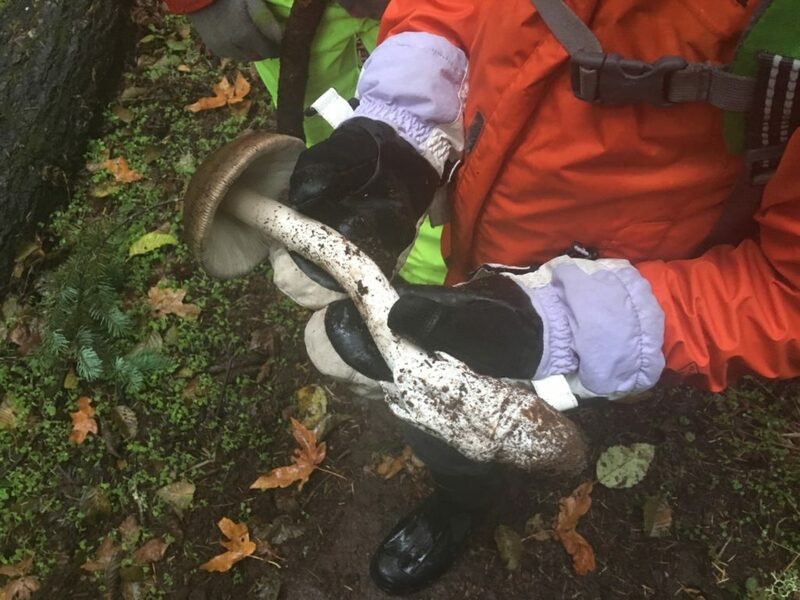 Now that we have time for such work, we will begin that process again in January, most likely working with the Oregon Department of Agriculture as our new certifying body. Again, most of our CSA will feel very familiar going forward: pick-up will continue to be Thursday afternoons, 3:30-6:30, with Casey and me both present to answer your questions and socialize. We will host two on-farm events this year: a potato planting party and potluck in May and a pumpkin patch in October (this year with live music, an apple tasting, AND cider pressing!). Each week, you’ll receive a thoughtfully written farm newsletter with news from the farm and information about your seasonal offering of vegetables. You’ll get to enjoy a full range of seasonal, organic fruits and vegetables grown here on our farm, by us and crew. You can find out more nitty-gritty details about the 2019 CSA (prices, dates, and all that) and how to sign up here. After all these years, I still marvel at the beauty of this model of growing and eating produce. It’s so simple and yet so effective at providing freshness and quality for the eaters and stability and enjoyment for the farmers. It’s the model that drew us to farming to begin with, and many years later we’re still hooked. Mailing our winter cards to friends and family takes several evenings of quiet work! We hope you are too! We are very excited to spend another year growing food for you! Many of our existing customers have already committed for 2019, and we are in the process of mailing out your 2019 invoices (with more CSA details) along with our annual family holiday card. If you receive a card without an invoice it means we probably still need to hear from you about your CSA participation in 2019! You can email us your desire to participate at farm (at) oakhillorganics (dot) com, and we’ll get you signed up. If you have any questions, you can email the same address or call me at 503-474-7661. We are taking new members as well, so spread the word! Once we have our cards and invoices all sent out, we’ll be focusing exclusively on holiday gatherings for a couple of weeks. Christmas celebrations with multiple families, caroling with friends, an upcoming visit from distant friends … and then the New Year will bring with it many new adventures, fresh focus on the farm work, and a new role for Casey. We feel humbled by the many experiences we have been gifted so far in life. We have had the great fortune to be able to pursue so many of our passions and to build wonderful relationships along the way. We wish you blessings on the next year of your own journey. May we all walk forward into the future with humble hearts, open to the unknown blessings ahead! P.S. Our Winter Holiday Harvest is happening this week as well! Place orders by Monday evening! More info and list of available veggies here. You read the list below and decide what you want and how much. Then send us an email with your completed list to farm(at)oakhillorganics(dot)com by the end of Monday. Please provide your name and cell phone number with your order in case we have questions! We’ll harvest your order and bring it to our downtown Mac farm storefront for you to pick up (and pay for) on Thursday, December 20, 4-6 pm. Our storefront is located off of the 2nd St parking lot between Evans and Davis Streets. If you have any questions, you can call me: 503-474-7661. Looking forward to seeing and feeding some of you next week! You read the list below and decide what you want and how much. You can order for your holiday meal or just simply to stock your pantry for the coming weeks. Then send us an email with your completed list to farm(at)oakhillorganics(dot)com by the end of this Sunday. Please provide your name and cell phone number with your order in case we have questions! We’ll harvest your order and bring it to our downtown Mac farm storefront for you to pick up (and pay for) on Tuesday, November 20, 4-6 pm. Our storefront is located off of the 2nd St parking lot between Evans and Davis Streets. Dottie makes one of the final bouquets of the year from the flowers in the kids’ garden. Here we are, friends — the 40th and final CSA pick-up of 2018. The completion of what I’ve been calling our “farmers’ dozen” year, hearkening to the “baker’s dozen” (although 40 weeks of local vegetables seems like a bigger addition than one extra bun or cookie!). 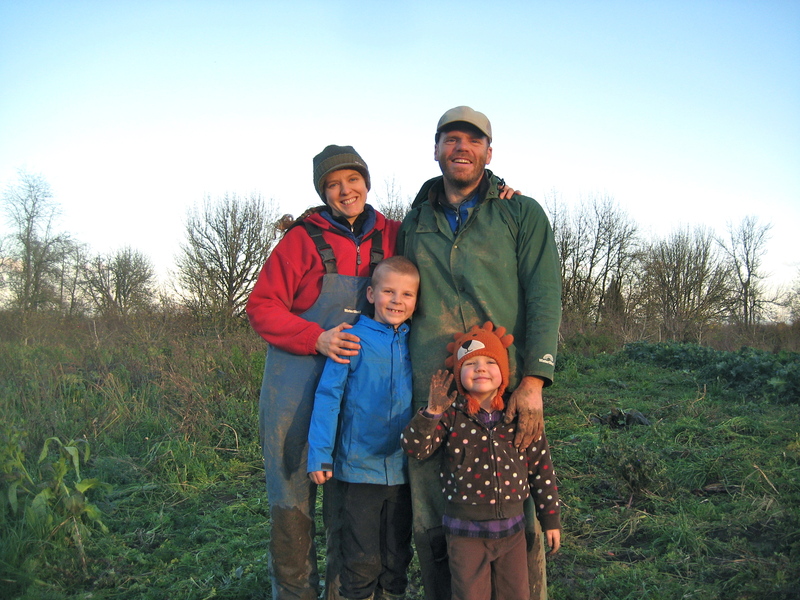 Casey and I have been farming here in Yamhill County for thirteen seasons. This is hard for me to wrap my brain around tonight. Much like with parenting, the time has flown by and yet those years feel so full that it’s hard to remember life before. Haven’t we always been farmers here in Yamhill County? Certainly, we have been for the bulk of our adult life. 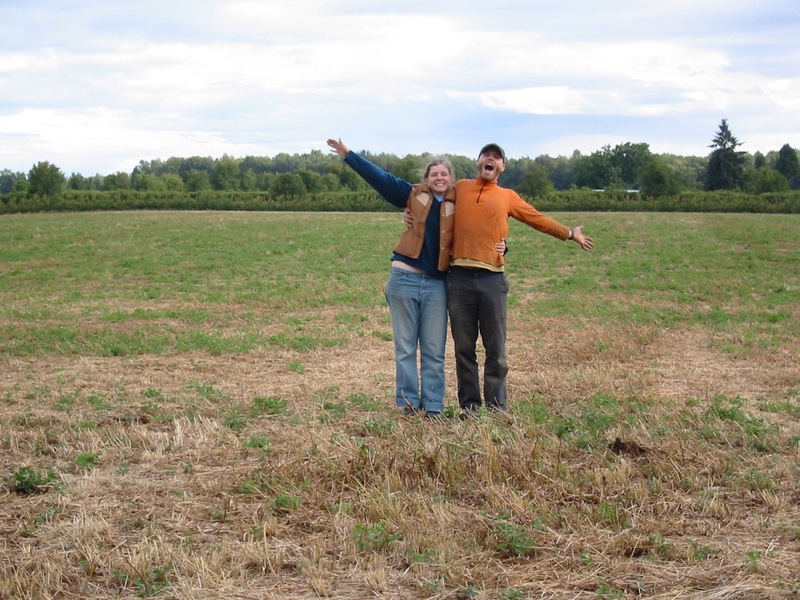 We were 25 and 26 when we first moved to McMinnville to start a CSA and put down roots. We knew even then that we wanted to live a very rooted life, where our community and our physical place would be deeply intertwined with our life in tangible, essential ways. Farming was such an obvious solution to that desire, allowing us to meet hundreds of people over the years, getting to know many of them quite well, and providing us an income based on the health and our stewardship of our home. In these thirteen years, the farm and our land and our community have changed continually. I don’t think that I fully appreciated how dynamic our lives would be from the vantage point of a 20-something leaping into a long-held dream. Back then, it was more two-dimensional — we would start a farm and then enjoy living on it for the rest of our lives. The end. How boring that would have been! And, of course, how unrealistic. 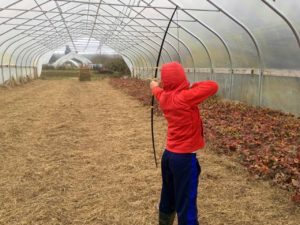 Instead, the farm has been an ever-growing, vibrant co-creator of so many different kinds of experiences and projects. Trees that I thought were tall when we moved here have continued to grow taller! Trees that we planted are now tall as well! We have grown and raised a wider variety of crops and animals than I anticipated from the start. But key moments stand out in my mind as being game-changers for us as farmers and dwellers in this place. The first was the birth of our son Rusty in 2009, which profoundly shifted everything. 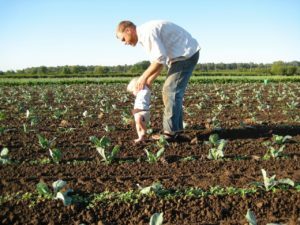 My own personal relationship to the farm changed as I added a new (and enormous) role to my life as primary parent. Both Casey and my perspective of the farm changed as we saw everything through Rusty’s new eyes. We came to appreciate mud and dirt as sources of creative play rather than just the by-product of our work. Our years of keeping animals and tending more land (100 acres at the max) were another enormous shift in how we experienced our farm, as a home to many creatures beyond us. Now, it feels as though we are nearing another potential transformation in our role here, as we work toward the upcoming election (20 days from today!). We still don’t know what the outcome will be, and we can only really guess at how each outcome will turn around and affect the choices we make in the near future about the farm. Connection to place and people continues to be the defining driver behind all that we do. Even though the work of serving as Yamhill County Commissioner will be very different, it too originates from this same love and continually deepening roots here. 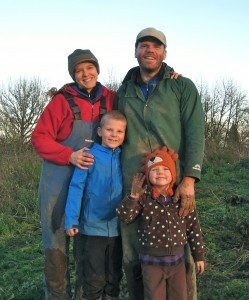 We became farmers because we wanted to do real work that would create positive connections in one particular place on the planet. Ditto for Casey’s bid for commissioner. We love growing things. I can’t even tell you how much we continue to love the miracle of growth. Every single spring feels like a revelation again and again, as we watch leaves and buds return to trees and plant seeds in the soil and get to participate (again!) in the mystery of existence. We love the feel of dirt on our hands and the satisfaction of physical work. Plants are amazing and beautiful (and delicious and nourishing too!). What form these two truths take in 2019 is still up in the air. But just knowing that we may be on the precipice of some new formulation of these truths has me feeling wistful this evening as I write the final newsletter of the year. The last thirteen seasons have taught me that life is full of evolution and change, so there are no regrets or unhealthy nostalgia — but I feel so much gratitude for the many versions of our farm that we have experienced so far. We have been nourished by living here and many (including us) have been literally nourished by our work here. Our home isn’t fancy; the land isn’t perfect. We have had struggles in how we work or what we do here too, as we’ve learned innumerable skills and lessons about what it means to farm, get along with people, and be stewards of a place. But, in all that imperfection is real goodness. It’s been good for us to be here in ways that are beyond words. So, as we wait on the precipice of something new, we give thanks for this season and the twelve that came before it. Enjoy this week’s vegetables! P.S. Want another walk down memory lane? I wrote a “remember when” post at the end of our tenth season that has lots of fun pictures from the first decade. You can read it here. This is it for 2018! Are you interested in 2019? You can “commit” by signing the form at CSA pick-up or dropping me an email with the number of items you estimate you’ll want! Holiday Harvests coming later this fall! We will still be doing our usual holiday harvests later this fall, one before Thanksgiving and one before Christmas. Watch your email for an announcement a week ahead of time! It will contain a list of what’s available, from which you’ll place your custom order and then meet us at the storefront to pick it up! It’s always a favorite part of our family’s holiday traditions as we get to touch base with people. And, we love knowing that our vegetables will get to be a part of your holiday celebrations too. Have you noticed? It’s fall now. 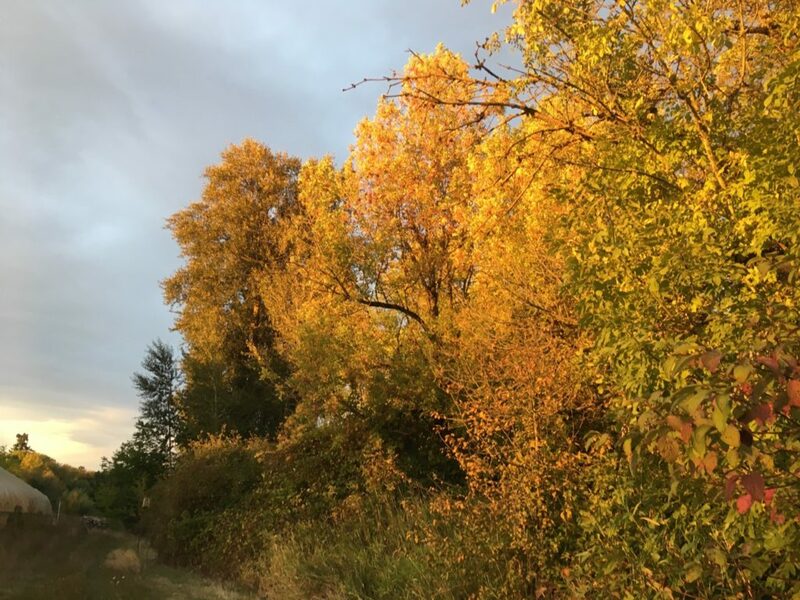 More than just fall — it’s October, which brings with it all its own unique sights and glories. Brilliant foliage. 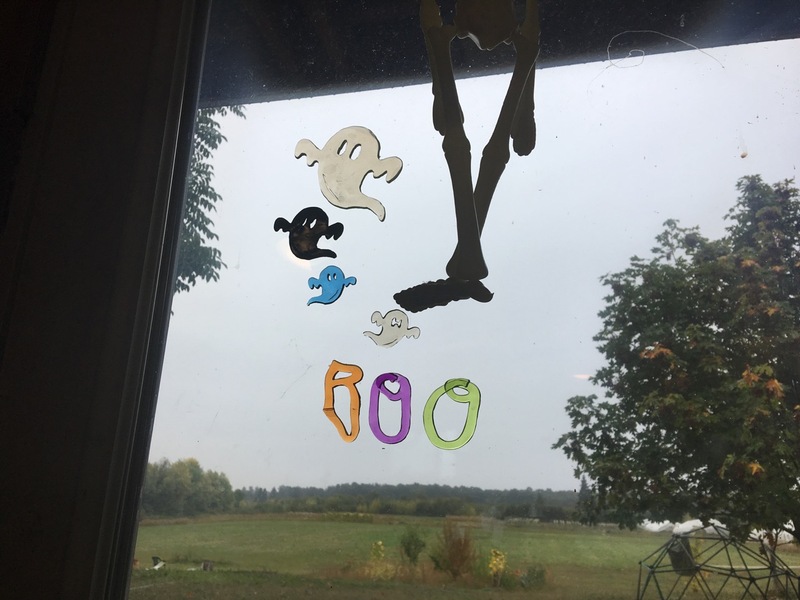 Spooky decorations. Fall harvests. The wrapping up of another CSA season. Yes! Next week (October 18) is our final week of the 2018 season! Have you signed up for 2019 yet? You can do so at pick-up this week, or drop me a quick email. Speaking of Halloween, we put up some spooky decorations this year, at the kids’ request. Casey and I would be content with all the natural seasonal stuff: acorns, pumpkins, leaves, etc. But ghosts and skeletons are fun too. 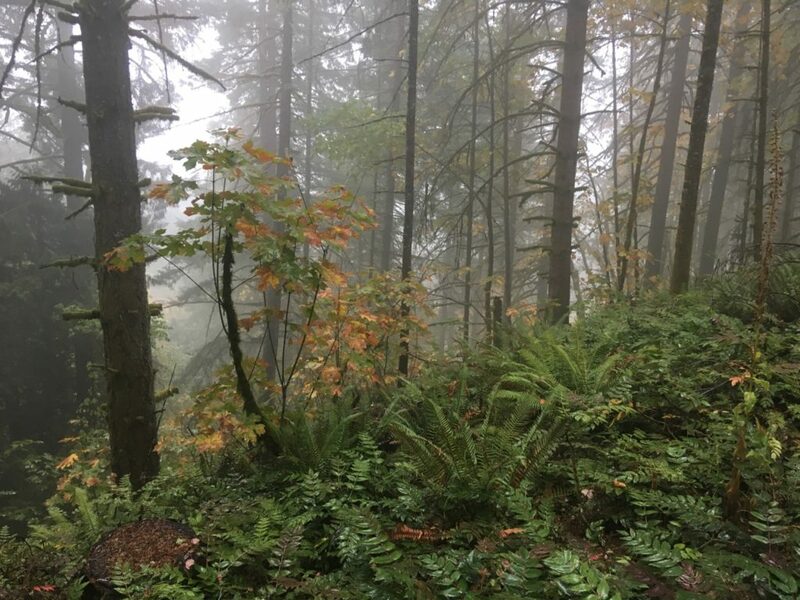 Last week we went for a hike at Miller Woods in the rain! 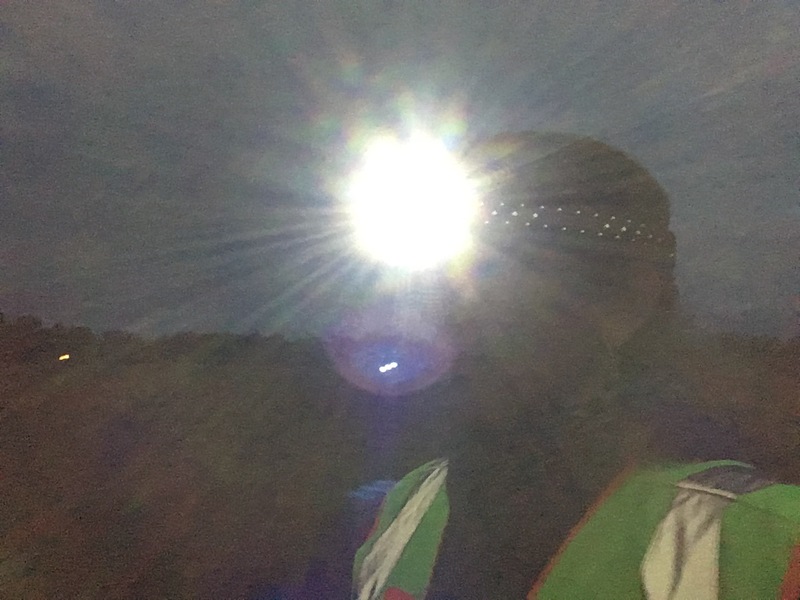 It was a great way to remind ourselves that our outdoor life doesn’t have to end when the seasons turn cold and wet … we just have to make sure we’re appropriately outfitted so we can stay comfortable and continue to enjoy ourselves. Also, the misty woods are simply gorgeous. Like I said: warm clothes! Oh, and we found a mushroom! Western Grisette, I think. The rough-skinned newts were also enjoying the rainy forest. We saw several crossing the path. Last Friday, we also built our first fire of the fall! And, then Rusty built a nest in front of it. October on Grand Island means that it’s Heiser’s season. We visit the pumpkin patch almost every weekend. It’s one of the few destinations in our life that we can actually walk to (which the kids and I did this Sunday). 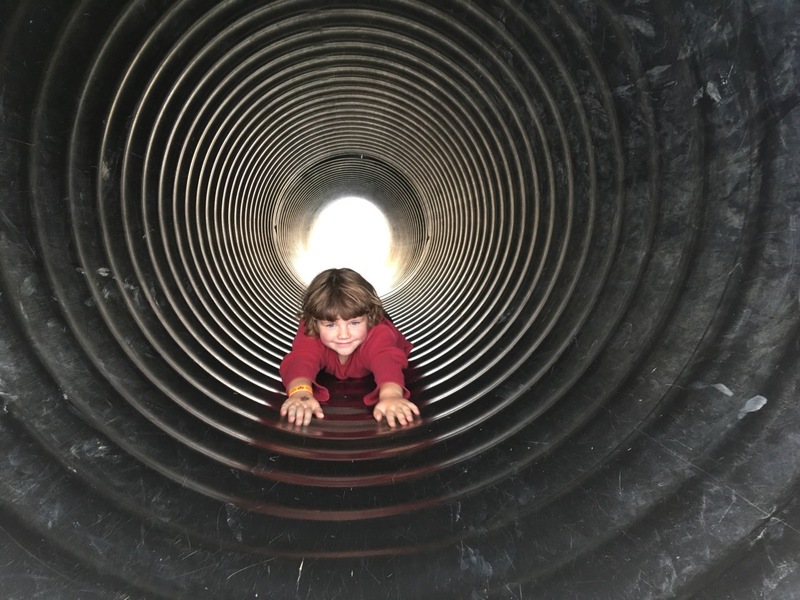 The BIG slides at Heiser’s are super fun! Shortening days also means that I’m now often starting my morning walk before the sun comes all the way up. Safety first! One more week, everyone! Enjoy this week’s vegetables! Beets — Time to make “root parade”! What is root parade? That’s when you line up all the “roastable” vegetables (heavy on the roots) in your house on your counter (making a parade) and then chop them up and roast them together! You might just call this roasted fall vegetables. We call it root parade. Beets are a great ingredient, along with delicata squash, carrots, potatoes, and onions! What a beautiful fall afternoon for harvesting! It’s days like this that drew us to our work to begin with — Casey ends up working outside in all kinds of weather throughout the year. You name it; he’s worked in it: heat waves, wind storms, downpours, cold spells. He has even milked a cow on pasture in deep snow! Admittedly, sometimes working in all kinds of inclement weather can be exciting. But when the weather seems to stall into a long period of something hard, such as very hot weather or very rainy weather, it does eventually lose its appeal. Not because being outside in all weather is hard, but more because often the work itself just gets harder because weather affects more than just our bodies. In hot weather, we have to be mindful of what time of day we harvest certain crops and how quickly we get them into cold rinse water and then the cooler. In rainy weather, every motion can take just a little bit longer because of the delays in working to avoid making mud (for example, we’re less likely to drive our field vehicle down a row and so each individual bin has to be carried a longer distance). But then days like today come along and the golden sunlight falls so gently over everything. Birds sing. The fall harvests offer up their abundance. This season is a gift every single year. We’re soaking it in, knowing that the darker and wetter weather is soon to come! 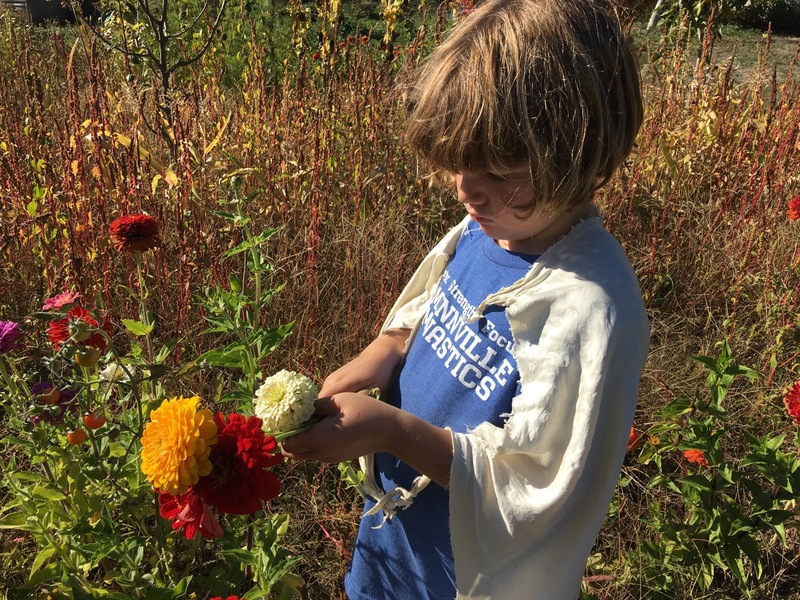 Although this late fall will look very different for our family as we are ending the CSA in mid-October rather than late November (or even mid-December as we did our early years before we learned that some weather is just not worth working through). It will feel unusual to be done a month earlier, but it will be good this year — after 13 long seasons, a slightly earlier end will provide room for some other work. Plus, this CSA season will still have been 40 weeks long! After all these years, I still marvel at how this farm can produce such a wide range of delicious fresh food for such a very long season. We all get to eat well, in many kinds of weather! Commit now for 2019! We’re taking commitments for our 2019 season now, even though we don’t know the details yet. In our experience, it’s EVER so much easier for everyone to get on board while we’re all still in the rhythm of the weekly CSA harvest. Then we can do the work of communicating what you need to know over the winter, and you can rest easy knowing that your CSA produce is coming! After realizing that our website forms had stopped working sometime this summer, I’m going back to tried and true sign-up methods for now: you can sign up on the clipboard at CSA pick-up or drop me a quick email to let me know how many items you estimate you’ll want next year! (You can always change later.) Let me know if you have any questions! 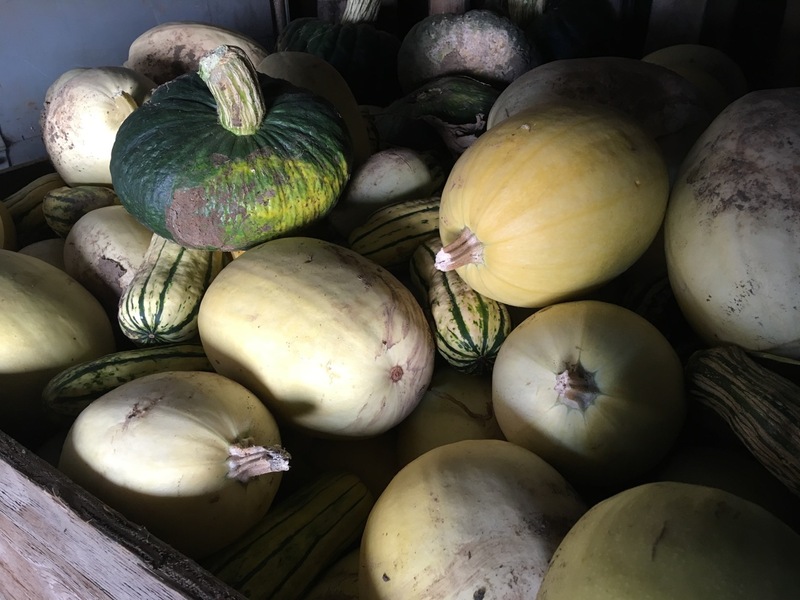 Winter squash — Various kinds! Part of the winter squash harvest already under cover. 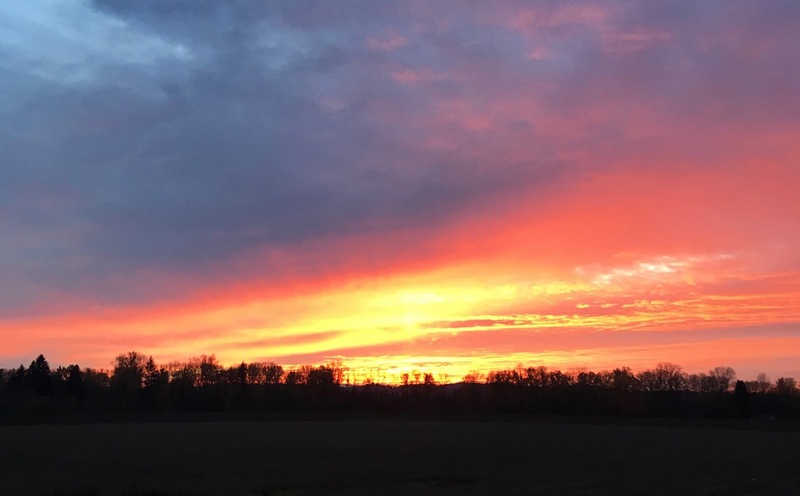 Fall arrived last week and with it thoughts here on the farm about 2019. We are always working a few seasons ahead out here. For example, we sow leek seeds into flats into March that we plant in May to be harvested the following March! Leeks and garlic are the crops that take the longest specific kind of forethought, but all of the farm operations require planning — where we will sow a cover crop this year to ensure good crops next year? And, now it’s time to think more concretely about wrapping up this season and preparing for the next, including some parts that require your cooperation. We only have three more weeks left of this year’s CSA, ending on October 18. This is the earliest we’ve ever ended the CSA, but because we started the year in mid-January it will still have been a very full, long 40-week CSA season (whew! That’s a lot of weeks of local vegetables!). Make sure you are all paid for up 2018. I’ll send out reminders to folks who still have a bit of their CSA balance left, but you can check with me at pick-up as well. Put our fall Holiday Harvest dates on your calendar! We’ll be doing these special custom harvests as usual this year, on November 20 for Thanksgiving and December 20 for the winter holidays. We will email you a notice when it is time to place an order. Here’s the deal with next year’s CSA. We’re going to be honest and say that we don’t know what it will look like yet. The big unknown, of course, is the November election outcome. We are drafting plans for both possible endings to the campaign, but we won’t be able to take action until we know whether Casey is going to be county commissioner next year, which is a full time job. Thankfully, there’s plenty of time between November 6 and the start of a CSA season to figure out details, including possibilities such as hiring a farm manager (we’ve already reached out to some people who might be well suited to helping Katie with the task of keeping things going). We’ll share our plans as soon as we know them so that you can make sure it all still sounds wonderful, local and delicious to you! But, in the meantime, if you have been happy with your CSA experience and would like to continue, we’re going to offer two easy ways for you to commit for next year now — and we’ll fill in the details regarding season length once we have them pinned down. As always, if something comes up for you in the meantime, nothing is set in stone, so you have nothing to lose by committing now to save a spot and help us plan accordingly. Plus, in our extensive experience, it is just simply so much easier for you to recommit now while you’re in the rhythm of receiving these emails and coming to CSA pick-up than for you to think about doing extra sign-up paperwork mid-winter. 1. Write your name and (estimated) number of items you want each week on the clipboard we’ll have at CSA pick-up for the next three weeks! And, for the remaining three weeks, the focus will be on all the delicious abundance fall has to offer. Check out this week’s list of options! Enjoy this week’s vegetables! P.S. That * above? That’s there because I realized tonight (!!!!!!) that all the sign-up and contact type forms I’d been using on our website have apparently (!!!!!!!!!) stopped working sometime in the past few days … weeks … or months! (!!!!!!!!) I’m working on figuring out how to get those handy forms up and running again because they’re GREAT (when they work! ), but in the meantime I’m sitting here realizing how many messages and CSA sign-ups we may not have received over the last few months because of a technical error running under my radar. Oh goodness, world, I am so sorry if you tried to contact us and we never heard! This website has given me loads of challenges this year as it gets older and clunkier. Perhaps one of this winter’s projects will be to revamp it from the foundation up so that I stop running into these kind of “hey-something-broke-and-you-didn’t-notice” problems!!! !